“Terroir” is a French term of mediaeval origin, which even at that time was already related to agriculture. In his Théâtre d’Agriculture et Mesnages des Champs, written in the 16th century, Olivier de Serres said that the air, the earth, and the plant constitute the basis of the vineyard. He thus summarised the three main components of “terroir”: the conjunction, in a specific place, of geological, soil, and climatic factors with the vine. In Littré one can read: “The quality of the land is transferred to the vegetables planted in it; it forms what we call the flavour of the ‘terroir’.” However, as Vauban points out, “it is undoubtedly true that the best ‘terroir’ cannot be distinguished from the worst if it is never cultivated.” Vauban thus highlights man’s essential and irreplaceable role on the land. MERLOT: Merlot is a variety that originates in the area of Bordeaux (France). Merlot buds early and ripens in the second stage (that is, before Syrah and Cabernet Sauvignon). It is vigorous with a drooping tendency that requires it to be trained on trellises. It adapts well to clayey or clayey-calcareous soils. Merlot produces well-rounded and bright-coloured wines with a fruity aroma (plum, blackberry…). SYRAH: The Syrah cluster is medium-sized to large, elongated, sometimes winged and reasonably compact, with long stalks. Syrah buds quite late and ripens in the second stage (between Merlot and Cabernet Sauvignon). Syrah wines have a sustained colour and an aroma that is spicy (pepper, cinnamon), rural (thyme and rosemary), floral (violet and rose) and fruity (raspberry, strawberry, plum). One may even perceive black olive, liquorice and gamey notes. CABERNET-SAUVIGNON: This is a widely grown variety in Bordeaux (France), from where it originated, and is the most widely planted variety in the world. This variety adapts very well to warm climates and has been adopted by vineyards all over the world. Cabernet Sauvignon clusters and berries can be small to large. Cabernet Sauvignon buds late and ripens late in the second stage. It is the last variety to be harvested on the estate. Cabernet-Sauvignon wines have a sustained colour and present a complex aromatic variety evoking fruits (cassis, strawberry) and vegetables (green pepper, broad bean). The soil, the cornerstone of the “terroir”, plays a predominant role in the quality of wines. On our estate three general types of soil coexist: sandy, clayey and clayey-stony. The plots, with gentle to steep slopes (up to a gradient of 12%), are situated at an altitude of between 235 and 355 metres. In the cultivation of our vineyards, the experience of countless generations dedicated to agriculture converge with the application of the most modern farming methods. All the vines on the estate are trellised. The planting density is low and the rows have a North-South orientation, which allows the vines to be illuminated with perfect sunlight on either side for both leaves and clusters. The double Royat cordon pruning system has been adopted. This is a short pruning method that enables us to distribute clusters well, both horizontally and vertically. In fact, as we see it, in order to produce a great wine the important factor is not so much limiting the yield but rather striking a balance between the amount of leaf area essential for ripening and the amount of fruit. As such, we have been carrying out a series of trials since 2006 in order to determine the best yield in respect of the given leaf area in order to obtain the desired wine quality. This is the name given to the work carried out on the vines, from budding to grape harvest. The aim of these is to strike an ideal balance between, on the one hand, the development of the leaves and vine shoots and, on the other hand, the development of the clusters. To begin with, not long after the vine has budded, we remove the young but unwanted shoots from the trunk and branches, thus ensuring optimum growth for the others. A few weeks after completing this operation, our team checks the vines in order to “clean” each vine stock and remove any unwanted shoots that may have continued to grow. The vineyards are equipped with a drip irrigation system. In order to manage irrigation properly it is essential to have precise knowledge of the water needs of the vines. We are constantly aiming to strike the best possible balance for the growth and development of the vines with the single goal of producing a high quality grape. After analysing the grapes in each “terroir unit” and having tasted the berries meticulously several times, the grape harvest date is set. 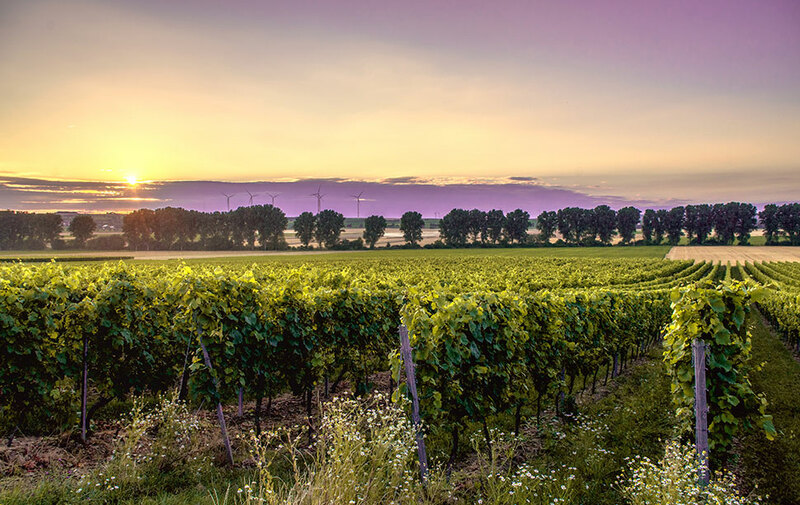 The aim is to harvest and ferment each “terroir unit” separately, that is, each variety on a given type of soil with the same behaviour over the course of the vegetative cycle. Grapes are collected manually, in boxes of 15 to 17 kilos in order not to crush the clusters. The boxes are immediately stored in a cold-storage room at 6ºC for 15 to 30 hours. The next day the boxes are unloaded over a selection table, where six people remove inferior quality grapes (dried out, damaged or from secondary clusters), as well as plant material (leaves, stalks). Once harvesting is over and grapes have been selected, the production process begins at the cellar facilities, a true technological marvel, where the main aim is to obtain a top quality product under the exhaustive control of our expert oenologist. FERMENTATION: Following stalk removing, the harvested grapes pass through a peristaltic pump on their way to the vats. The vats are filled from below. The press wines are systematically discarded. 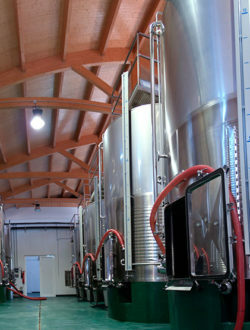 Only drip wines are used to build the composition of our wines. AGING: The wine is aged in medium-toasted, French oak barrels (of 225 and 400 litres, of which 40 to 50% are new, and the rest, one or two years old), for twelve to fourteen months. 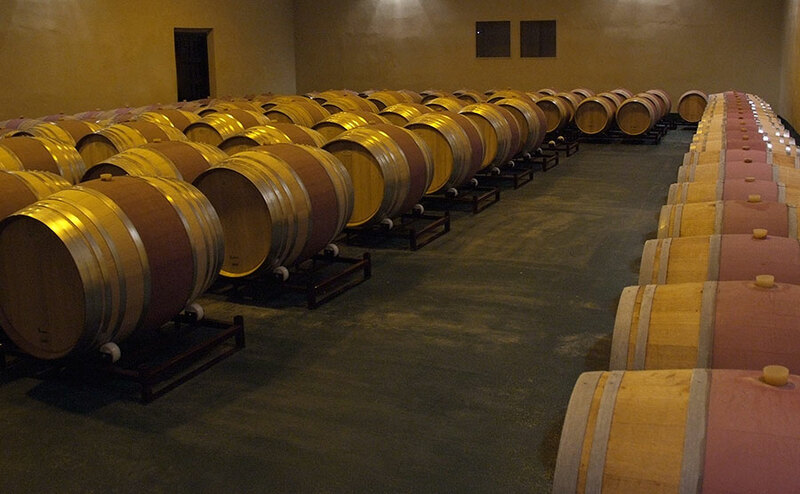 The barrels come from the French forests of Tronçais, Allier and Bertranges. The story of our red wine vinegar begins in 2007, when after months of testing, we decided to use our pressed wine, which we do not bottle, to produce vinegar with the traditional Orleans method, which uses surface-borne, acetic bacterial cultures with the bioreactors. This is a slow and paused method, which produces vinegar of the highest quality. Afterwards, the vinegar is aged in four year old French oak barrels for about thirty-six months, to produce a complex vinegar with great depth, where the wild fennel that grows on our Estate is macerated in the vinegar to add our characteristic, light note of licorice. We decide on the definitive blend by tasting the vinegar obtained from our Cabernet-Sauvignon, Syrah y Merlot wines, which is then clarified and lightly filtered before bottling when our enologist determines the vinegar’s moment of maximum expression. 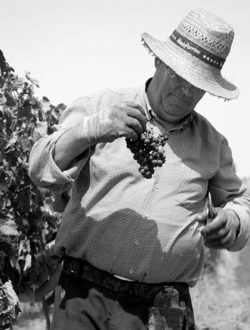 The Álvarez de Toledo family has been perpetuating the the tradition of olive oil and wine-making culture for generations on the Perales de Valdueza Estate in Extremadura.